I don’t know what’s scarier..that I’ve had a CHILD for half a year or that I have to go back to work in 6 months. Oy. Searching for childcare is no easy task and the cost of it? WOOF. It would probably be cheaper to pay to have my parents move here and help out. So, 6 months! What’s been going on? Well, LOTS. 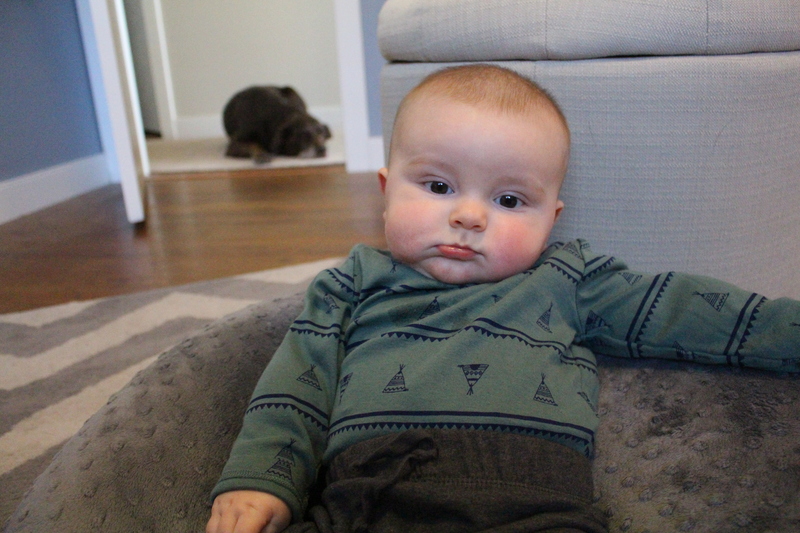 I feel like Wes has turned into a little person and less and less like a baby. He is obsessed with grabbing his feet and flailing about. Now I get why they call that pose happy baby in yoga. He also has his hands in his mouth 24/7. And when it’s not his hands, it’s whatever he can get his hands on. 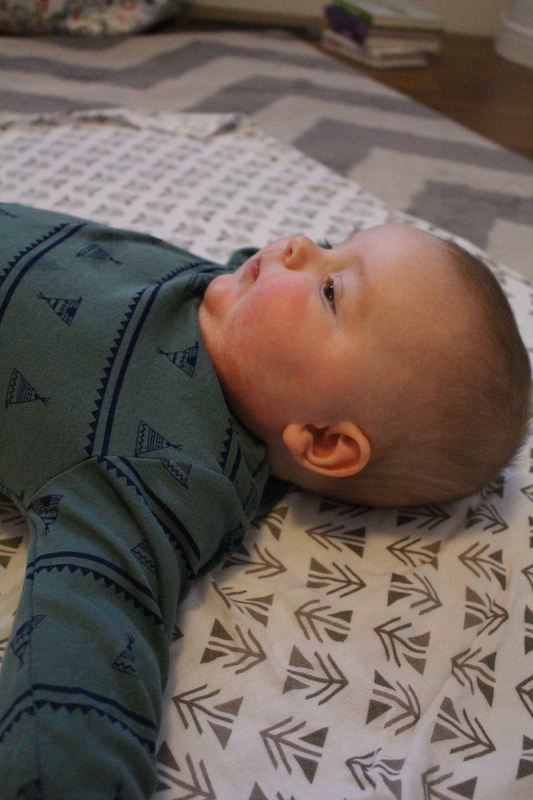 He’s started to try to sit up, he’s rolled over, and he can reach with both arms to grab for things. Most major development? 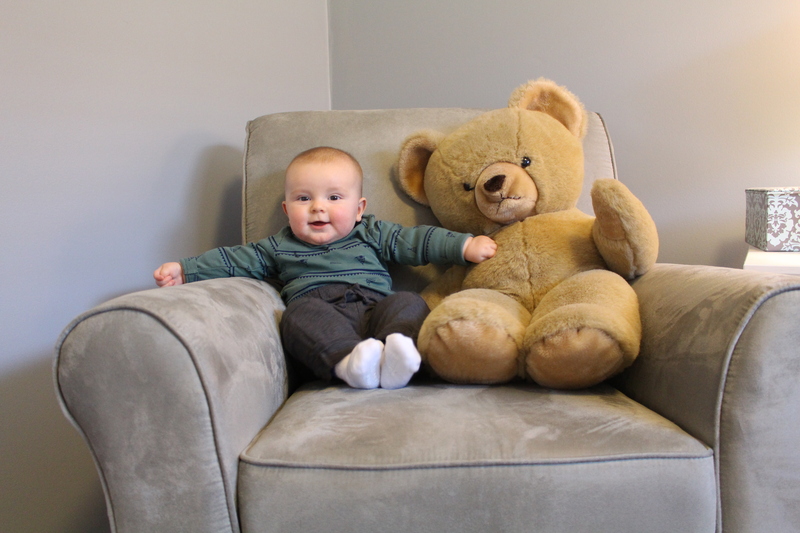 He is no longer in his infant car seat. This makes me ferociously sad, but he seems to love it! And he has had no problem facing outward in his strollers when we go for walks. If anything, he naps more! We started Wes on solids too. 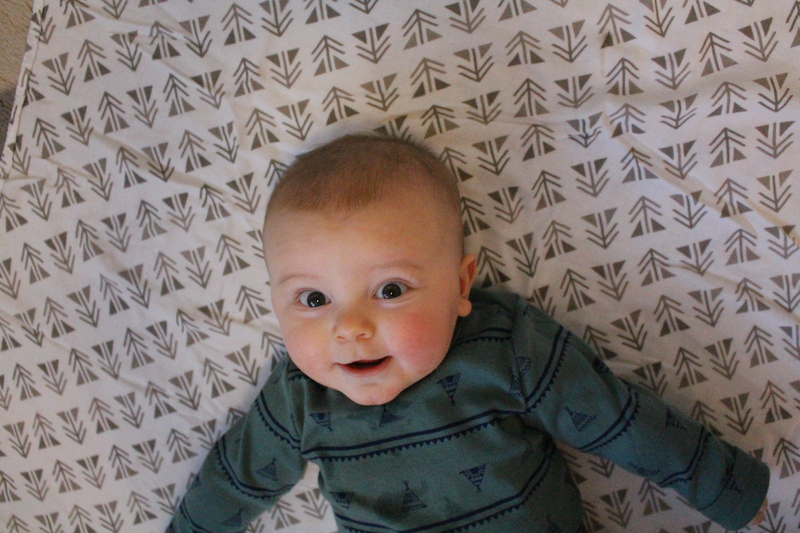 Last month, I introduced rice cereal into his bottle at night then gradually started making it thicker like actual cereal, then buying a lot of stage 1 and stage 2 squeeze packs that he now gobbles up like a champ. His favorite was the pear/spinach/peas combo. Who would have thought?! That’s my kid. He also got some local peaches and apples pureed while we were back home in NY. With that, comes weirder diapers. It’s kind of hilarious. He is OBSESSED with his jumperoo. I think he spends a cumulative 3 hours each day in that thing. He loves to rotate from activity to activity and just jump. Jump. JUMP. A lot of the time, he jumps himself to sleep! It’s also a nice distraction for him when I want to get my workout in during the day. With his increase in activity, he’s more regulated in his napping which is a GOD SEND. Usually one at 9ish, 1ish and 4ish. Usually. I cannot tell you how much more I get done around the house now, it’s insane. For the first time ever, I actually showered while he napped. That has never happened because I was so paranoid he’d wake up from the noise of the shower (our house is small, y’all). We had a few instances in New York when he would wake up at 3/4am and would require a feed, but other than that he has slept through the night from 7:30pm-6:30am. Wes now knows his name and will respond when called. He is also a lot better at following sounds and looking around and really focusing on things. I swear he loves the dogs. Mostly Reggie, even though Reggie still gives zero craps about him. Layla is ALWAYS wherever Wes is. He’s started to grab for them and at first I was all AHHHH DOG HAIR IN HIS MOUTH. But then I realized it’s a lost cause. Especially when I find dog hair in his diapers. Whatever. He’s still got that stupid eczema on his neck which I’m constantly slathering with cream. I feel really bad for him, but he doesn’t seem to mind at all. He has a gorilla face that I think is the funniest thing ever. He usually makes it when he’s super concentrating (not to be confused with poop face) or when he gets so excited about something. He is still a super jolly kid and I’m just WAITING for the photos to reflect that. We had his 6 month check up this morning and he was all smiles with the doctor. 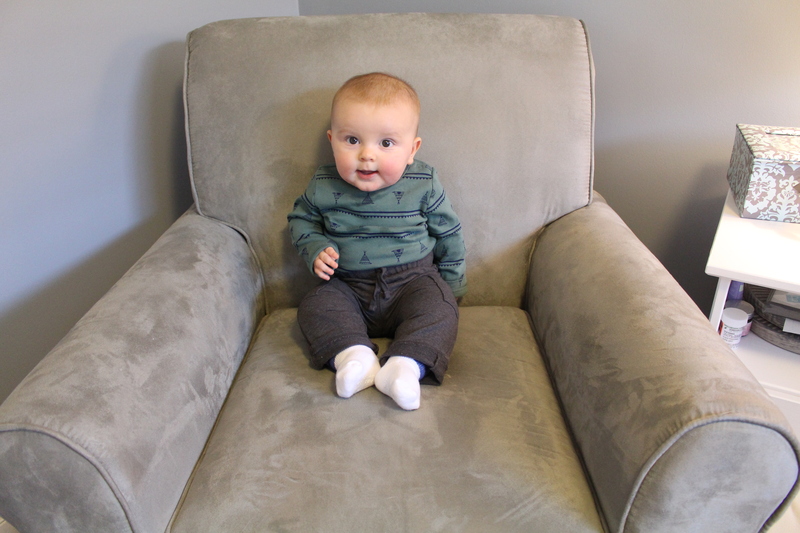 FYI: weight is 20.5 lbs, 27 inches and an 18 inch head (for all the smarts). 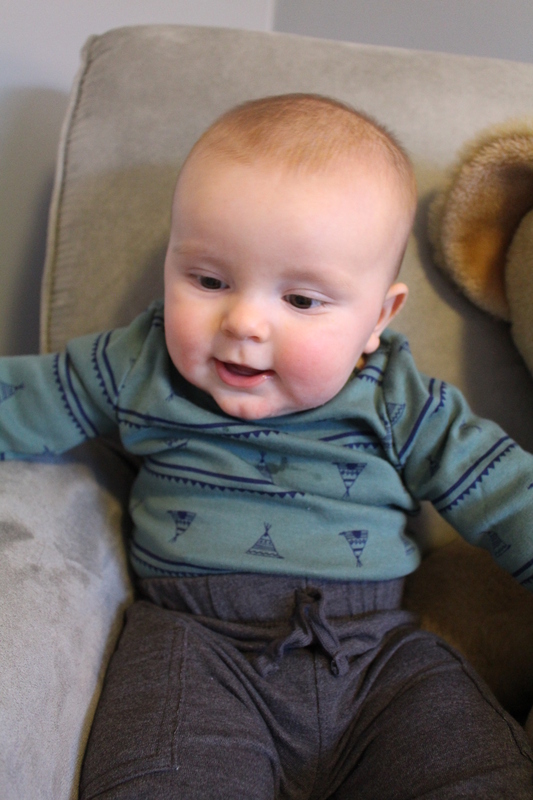 Right after his doc appointment, we headed over to the health center for his 6 month vaccine where he was again all smiles and only made one cry as the needle went in. I swear all doctors and nurses love him to pieces. 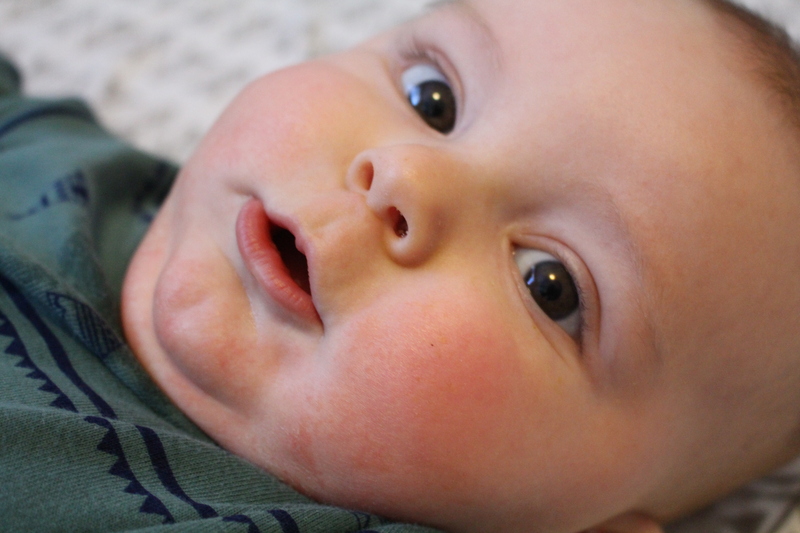 …and we go through about a zillionty bibs every day because the boy’s a drooler! No teeth yet though. He has a loud voice and loves to babble all the time. Especially if you put a burp cloth up to his mouth, he will yell so you can repeatedly pat his mouth with it to make it sound funny. 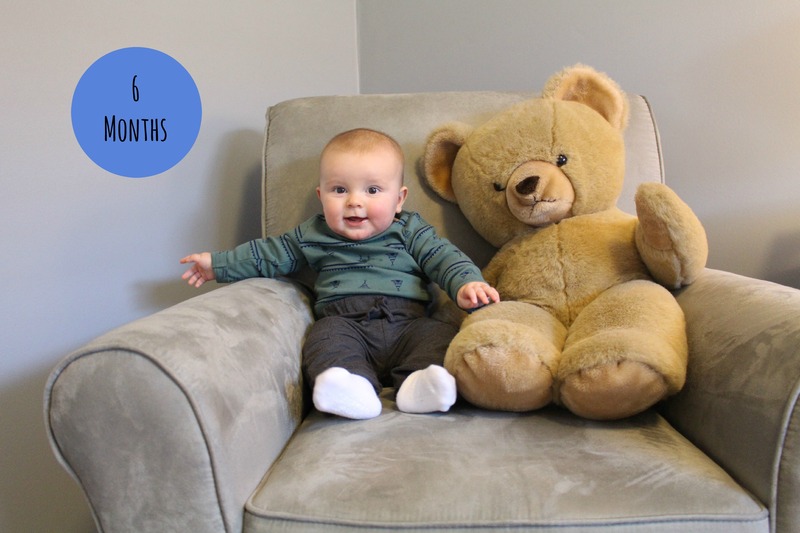 6 months already?! Such a cutie! I hear you, I have a mini stroke every time I think of how much it will be for 2 kids in dayhome FT, Gag! 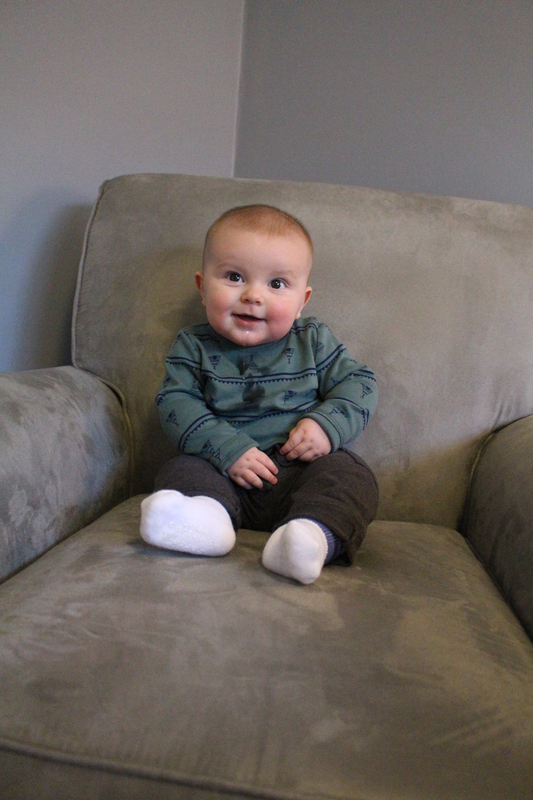 He is adorable and I think he looks like a very happy baby in the photos! Funny, A is 23lbs but a friend of mine has a son the same age (days apart from A) and at 9 months he was 26lbs, now at 2 he is 27lbs! So it all evens out. Time really does fly by when you have a baby! It’s not fair 😦 Amelia has recently started loving her Jumperoo again too…she goes nuts in it! Awww, he’s so cute!!! 6 months already though?! Seriously, time needs to slow down!! !